– Moisturize. Soothe. Help repair. "I recently got my very first bottle of Skintifique Hydrating Gel Plus HS and I'm *obsessed*. This cream is MAGIC! I have super dry skin, especially in winter, and have tried almost every cream, serum and lotion on the market from low end to high over years and years and NOTHING has ever worked as quickly and as well as this one. I'm hooked." "I have severe psoriasis on my hands. For instance, I almost couldn't get clearance to visit a power plant because they couldn't get a good enough set of prints, even with oil and rolling my fingers, to do an FBI check. I am one of those people who have "tried everything" from bees wax to zinc with brief relief at best. 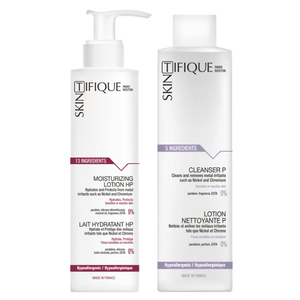 Recovery with Skintifique takes a few weeks because there is no accelerated healing, like from a steroid cream, but after a few weeks, the dry skin is gone and my healthy hydrated fingers don't crack and bleed when I button my shirt!" "I apply this cream to areas other than my face such as my earlobes, and my hands (especially around my fingers). [...] I believe it gives me that extra protection against any allergens that will cause a flare up, especially when I am wearing costume jewelry for a long period of time." On this page, you will learn all about contact dermatitis: what is it? What are the symptoms of contact dermatitis? How can it be treated?